We live, eat and breathe fences in all forms. Whether you need chain link, snow, vinyl, privacy or some other fencing we have an answer...and it's surprisingly affordable! We know rhat our reputation is only as good as the results of our last fence project. That's why we pride ourselves in a results oriented approach. At Northern Michigan Fence Company we take our experience and use it to keep your fence project on time and within budget. Bringing fence construction expertise to everyone. 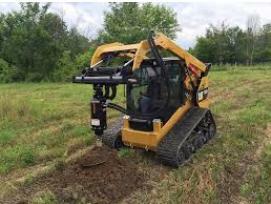 "We started Northern Michigan Fence to accomplish one and only one goal: Make expertise in residential and commercial fence construction available to everyone." 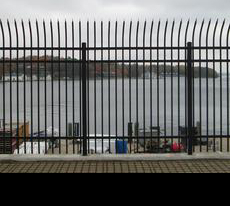 Aluminum ornamental fencing is both very attractive and practical. With either a painted baked enamel or annodized finish, aluminum lasts and last and provides visual beauty. This is a typical commercial installation where beauty as well as practicality are important. Nothern Michigan Fence thinks your fence should not only perform the duties of protecting your property, but it should also be nice to look at. We install privacy fences. 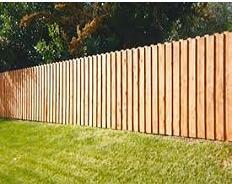 One of the most popular styles is shown here....the cedar picket fence. 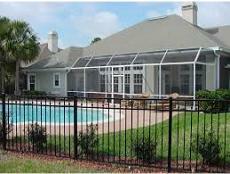 We can install this type of fence rapidly, in as little as one or two days, if time is important to you. It can be painted or left to weather into an attractive silver grey color and of course, cedar is practically impervious to the ravages of weather and the elements. 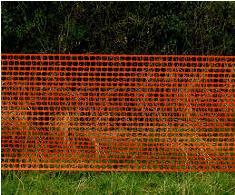 We are able to install temporary fencing at construction and building sites rapidly and inexpensively. We know that the rigors of the job site require quick and comprehensive action and a thorough knowledge of OSHA and MIOSHA fencing requirements. Safety is a big concern in many fence installations and one of the greatest is fencing for swimming pools and other "attractive nuisances." Call us and we can show you an attractive and effective solution for your recreational needs. Yes, we work 12 months of the year, unlike other companies that make you wait until Spring. We strive every day to continue to earn that trust!